Where’s the Year-Round Trout Fishing? 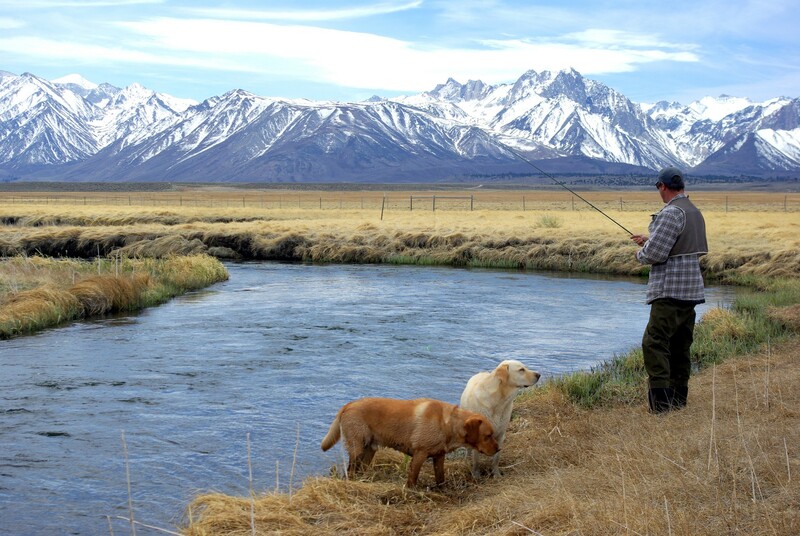 Answer: In March 2007, 10 waters across the state were opened to winter angling, including the East Walker River, Hot Creek and the Upper Owens River. Before this, many trout-bearing waters in the state were closed from Nov. 16 through the Friday proceeding the last Saturday in April. Department of Fish and Game (DFG) biologists from the Heritage and Wild Trout Program work to improve, enhance and increase angling opportunities for wild trout throughout the state. They looked for waters that were previously closed during the winter months that could be opened to angling when biologically justified. According to Fisheries Biologist Jeff Weaver, the East Walker River, Hot Creek and the Upper Owens River were selected because they are highly productive streams with robust trout populations and are generally accessible during winter months. Each stream was assessed based on its individual merits. Additional waters across the state may qualify for future consideration for winter angling opportunities. Part of the rationale supporting the opening of additional waters are that scientists from other states have not observed significant impacts to their fisheries in waters open year-round. Several research articles have also concluded that catch and release mortality is greater during warmer summer months than during cooler winter months. Angler usage is expected to be low during the winter months due to inclement weather and difficult access conditions. It is also important to select waters from across California that provide reasonable access to anglers in different parts of the state. The other seven rivers opened to year-round fishing included the Pit, North Fork Yuba, Truckee, Little Truckee, American, East Fork Carson and the Tuolumne River. There is a zero bag limit on these waters from Nov. 16 through the Friday proceeding the last Saturday in April and only barbless artificial lures/flies may be used. In addition to all 10 waters listed above, there are other trout-bearing streams in California open to year-round angling, too (e.g. Upper Sacramento River). Check the DFG Freshwater Sport Fishing Regulations online at http://www.dfg.ca.gov/regulations for more information and for seasonal regulation changes. Can You Return Abalone to the Same Rock? Answer: There is a law prohibiting this both for the health of the abalone and to prevent high-grading. All legal-sized abalone detached must be retained by the person who detaches it. In addition, no undersize abalone may be retained in any person’s possession or under his control. Undersize abalone must be replaced immediately to the same surface of the rock from which detached. (FGC Section 29.15[d]). In addition, according to DFG Lt. Dennis McKiver, no person shall take more than 24 abalone during a calendar year (FGC Section 29.15[c]). If the diver takes three legal-sized abalone and puts them back, those abalone still count toward both the diver’s daily and yearly limit. This means that divers must still record those abalone on their report card so as to not exceed their yearly limit. If a game warden sees someone take a large abalone that is obviously larger than seven inches and the person puts the abalone back, this person has just violated Section 29.15(d). If that person then doesn’t record the abalone, he is guilty of failing to complete the Abalone Report Card as required. Game wardens on the North Coast have written several citations for this, usually to trophy hunters looking for that elusive 10-inch abalone. The wardens try to convince people hunting for trophy abalone to measure them before removing them from rocks. Answer: Resident small game (as listed in CCR, Title 14, Section 257) may be taken with an air rifle firing pellets and powered by compressed air or gas. This includes: wild turkey (must use 0.20 caliber or larger), Eurasian collared doves, quail, non-protected squirrels, jack rabbits and cottontails, in addition to the other resident small game species defined in section 257. Western mourning dove, white-winged dove and band-tailed pigeons are listed as migratory game birds and may not be taken with an air rifle. This entry was posted in Abalone, Firearms/Ammunition, Fishing, Regulations, Waterways and tagged abalone, fishing, freshwater fishing, hunting. Bookmark the permalink. book-marked to check out new stuff in your web site. Magnificent work. I’ve read your previous responses and you’re just extremely wonderful. I actually like what you’ve bought here, certainly like what you’re stating and the how you say it. You’re making it enjoyable and you continue to keep it sensible. I can’t wait to read much more from you. This is really a wonderful website.